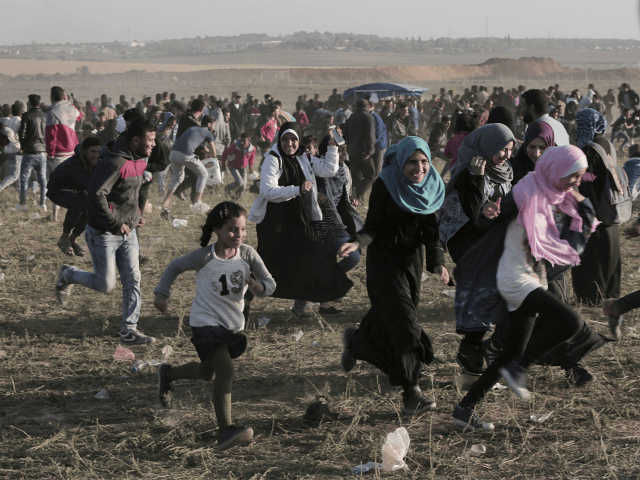 TEL AVIV – The Hamas terror group sent a seven-year-old girl to the Gaza security fence during violent riots on Friday, the IDF said. “When the IDF troops realized it was a girl, they picked her up and made sure that she could get back to her parents safely,” the army said. “Hamas cynically uses women and children, sending them to the fence and endangering their lives,” the statement continued. “Hamas is using you and distracting your attention from its responsibility to take care of you and govern the Gaza Strip. Hamas is sacrificing you to move forward with useless agendas and wasting millions instead of investing in your well-being,” wrote Adraee on Twitter. “Don’t let Hamas use you! Don’t put yourselves in danger for nothing. You deserve a better future than what Hamas has planned! You deserve more than a reality of violence, incitement and terrorism,” he added. Sixteen Palestinians were killed during the clashes, at least 10 of whom were identified as members of terror groups, the IDF said Saturday. The army published a list of the terrorists along with their positions in various terror groups – with eight coming from Hamas. The riots saw rocks and Molotov cocktails hurled at Israeli soldiers along the border by a crowd of some 30,000 Gazans attempting to storm the fence. There was an instance of live fire as one rioter shot at the troops. The IDF responded mainly with tear gas and rubber bullets, and only rioters who explicitly used violence against troops or were seen damaging or breaching the security fence were targeted with live fire, the army said. “We have identified attempts to carry out terror attacks using the protests as cover,” said Maj. Gen. Eyal Zamir, head of Israel’s Southern Command.